Introduction The BRAF V600E mutation is the most common genetic event in papillary thyroid carcinoma (PTC). The BRAF V600E mutational status has a significant diagnostic and prognostic role in PTC since it can be detected in 32%–87% of PTC by various molecular methods. 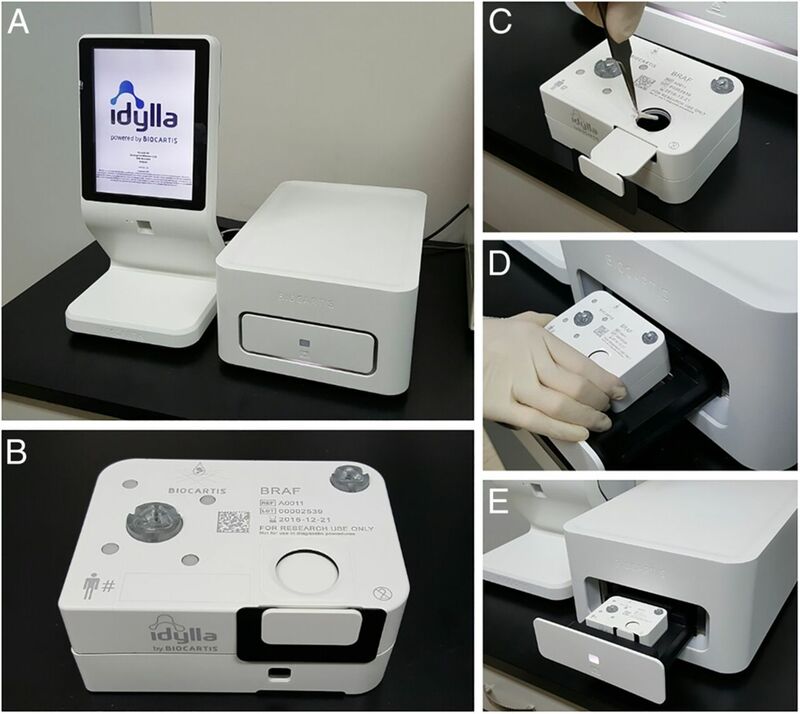 Aim(s) A novel, fully automated real-time PCR-based Idylla test is assessed to detect the BRAF mutation in formalin-fixed paraffin-embedded (FFPE) thyroid samples. Methods 99 PTC and 11 nodular hyperplasia FFPE thyroid tissues are evaluated for the BRAF V600E mutation by the Idylla tests and compared with peptide nucleic acid-clamping PCR, real-time PCR and pyrosequencing. Results The sensitivity and specificity of the Idylla test to detect BRAF V600E are 98.8% and 100%, which is superior to real-time PCR and pyrosequencing. The concordance between Idylla and true positive is highest at 0.974. Conclusions This study validates that the Idylla test is a sensitive and specific method to detect BRAF V600E in FFPE thyroid tissues. A simple, quick and easy to handle Idylla test is a useful and reliable molecular technique to evaluate BRAF mutations. The detection of BRAF V600E point mutation has been investigated by various methods including direct sequencing, dual-priming oligonucleotide (DPO)-based multiplex PCR, real-time PCR, pyrosequencing and peptide nucleic acid (PNA)-mediated clamping PCR.15–17 These methods have a high sensitivity and specificity to detect even small amounts of V600E mutant in a wild-type DNA background. However, most molecular techniques require a complex infrastructure, labour-intensive procedures and long turn-around time.18 The novel Idylla test (Biocartis) is a real-time PCR-based BRAF V600E mutation detection unit. The Idylla system is a fully automated technology with short turn-around times (120 min) without necessity for additional infrastructure or technicians. The aim of this study is to validate the Idylla test for detection of the BRAF V600E mutation in PTC and nodular hyperplasia (NH). The BRAF V600E detection by the Idylla test is compared with PNA-clamping PCR, real-time PCR and pyrosequencing methods to determine diagnostic validity and evaluate the clinical and pathological significance of the BRAF mutation in cases with PTC. All samples were derived from formalin-fixed paraffin-embedded (FFPE) surgically resected thyroid samples from Department of Pathology, Chungnam National University Hospital between January 2010 and August 2010. The tissues consisted of 99 PTC and 11 NH samples. These samples were provided by the National Biobank of Korea, Chungnam National University Hospital. This study was approved by the Institutional Review Board of Chungnam National University Hospital (CNUH 2016-04-040). All cases were pathologically reviewed by two pathologists (M-KY and J-MK) and the most representative area was selected on the H&E-stained slides. To evaluate the BRAF V600E mutation, tissue sections were macrodissected to achieve at least 50% of tumour cell content. The dissected paraffin-embedded tissues were directly placed into the Idylla BRAF cartridges and instructions for the Idylla BRAF mutation test were followed. For PNA-clamping PCR, real-time PCR and pyrosequencing methods, genomic DNA were extracted using the QIAamp DNA Mini Kit (Qiagen, Hilden, Germany) after deparaffinisation with xylene and it takes approximately 90 min. The Idylla platform (Biocartis, Mechelen, Belgium) is a sample-in result-out fully automated real-time PCR system. This platform integrates sample preparation, PCR thermocycling and fluorescence detection. It uses a disposable cartridge able to detect specific target sequences through an automated set up workflow (figure 1). In the cartridge, 20 µm thick slices of FFPE tissues are emulsified with integrated buffers and using high-frequency intensity focused ultrasound. Simultaneously, samples are rehydrated in an aqueous solution leading to DNA liberation. Where after, extracted nucleic acids are transported into separate PCR chambers via microfluidic channels. The chambers contain predeposited PCR reagents (primers, probes, enzymes) and an endogenous sample processing control. Detection of the specific targets is performed using fluorescently labelled probes. The Idylla system with computer console (left) and tissue processing unit (right) (A). The Idylla BRAF mutation test cartridge (B). The workflow of the Idylla BRAF mutation test; load formalin-fixed paraffin-embedded (FFPE) sample into cartridge (C), load cartridge in the Idylla tissue processing unit (D), press button to close drawer of the Idylla tissue processing unit (E). On a sample in one cartridge both the multiplexed BRAF wild-type and V600E mutations are detected. The presence of a mutant genotype is determined by calculating the changes in quantification cycle value (ΔCq), which consists of the difference between the BRAF wild-type Cq and the V600E Cq value. Post-PCR curve analysis is automatically calculated and interprets the results. The mutant signal is considered valid if the ΔCq is within a validated range, and the sample will then be characterised as BRAF V600E mutation positive, indicating the specific mutation group. All samples with a valid wild-type signal but a ΔCq value outside the validated range are characterised as BRAF V600E mutation negative. Adequate DNA input/quality and successful PCR amplification are controlled by amplifying a reference sequence of the BRAF wild-type gene. The Idylla BRAF mutation test shows four possible results on the screen of console: (1) no mutation detected in BRAF codon 600, (2) mutation detected in BRAF codon 600, (3) insufficient DNA input and (4) invalid. The time to transport a result takes approximately 120 min. The PNA-mediated clamping PCR uses the PNA Clamp BRAF V600E Mutational Detection Kit (Panagene, Daejeon, Korea) to detect the BRAF V600E mutation. A 25 µm thick (diameter of tumour ≥1 cm) or 50 µm thick (diameter of tumour <1 cm) slices are macrodissected from FFPE samples. Genomic DNAs are extracted and mixed with a PNA probe, primers, SYBR green PCR master mix totalled a volume of 20 μL. Real-time PCR reaction with a PNA probe is performed according to the manufacturer's instructions. PCR cycling conditions include a 5-min hold at 94°C followed by 40 cycles of four temperature steps (30 s at 94°C, 20 s at 70°C, 30 s at 63°C and 30 s at 72°C) and a 5 min extension at 72°C. The PNA probe locates between the forward and reverse primers in the template, which is designed to hybridise to the wild-type BRAF sequence. The PNA probe inhibits amplification of the wild-type allele and enhances preferential amplification of mutant sequences. Positive signals are detected by intercalation of SYBR green fluorescent dye. The threshold cycle (CT) is automatically calculated from the PCR SYBR green amplification plots. The delta CT (ΔCT) value is calculated by subtracting the CT value of a sample from the standard CT value of a PNA control sample. The cut-off for determining the presence of mutant is ΔCT=2. The time to transport a result takes approximately 120 min except DNA extraction. The real-time PCR uses the Anyplex BRAF V600E Real-time Detection Kit (Seegene, Seoul, Korea) to detect the BRAF V600E mutation. Thick slices measuring 50 µm are macrodissected and nucleic acids extracted. The reaction mixture contains 2 µL of BRAF Oligo Mix (X10), 3 µL of 8-methoxypsoralen solution and 10 µL of Anyplex PCR master mix (Seegen) including DNA polymerase and buffer with deoxynucleoside triphosphates. The reaction tube is agitated by inverting it five times or by quickly vortexing. A total of 15 µL of the reaction mixture is dispensed into 0.2 mL PCR tubes. The extracted DNA is added to the reaction mixture tube to reach a total reaction volume of 20 µL. Real-time PCR is performed on an ABI 7500 real-time PCR system (Applied Biosystems, Carlsbad, California, USA) under the following conditions: hold for 15 min at 95°C, followed by 15 amplification cycles (15 s at 95°C and 30 s at 60°C) and then 35 amplification cycles (30 s at 95°C and 32 s at 60°C). The CT value of the real-time PCR assay is defined as the number of cycles at which the fluorescent signal exceeds the threshold. A CT value <40 is considered as positive between the sample and internal control. Each run contains both a positive and a negative control. The time to transport a result takes approximately 90 min except DNA extraction. The pyrosequencing is a genotyping analyses based on real-time monitoring of DNA synthesis and used to acquire quantitative estimation of BRAF V600E mutation. Slices of 40 µm (diameter of tumour ≥1 cm) or 60 µm thickness (diameter of tumour <1 cm) are macrodissected. The reaction mixture contains 20 ng of extracted genomic DNA, PCR premixture (BioFact, Korea), 1 μL of 10 pmol/μL Primer-S, 1 μL of 10 pmol/μL biotinylated-Primer-As and 1 μL of UDG. PCR amplification is performed on a 224-base pair region of exon 15 in the BRAF gene using forward (5′-CCTCACAGTAAAAATAGGTG-3′) and reverse (5′ biotin-GATTTTTGTGAATACTGGGAA-3′) primers (Qiagen, Valencia, California, USA). The PCR condition consists of denaturation (50°C for 3 min; 95°C for 2 min; 40 cycles of 95°C for 20 s), annealing (52°C for 40 s), elongation (72°C for 30 s) and a final extension (72°C for 5 min). The PCR reaction is confirmed by electrophoresis in a 2% agarose gel and visualised by ethidium bromide staining. The PCR product is immobilised on streptavidin-coated Sepharose HP beads (Amersham Bio-sciences, Sweden) and incubated with 15 pmol of the respective sequencing primer (5′-TGATTTTGGTCTAGCTACA-3′) on the PyroMark ID heat-block at 80°C for 2 min. Pyrosequencing is performed on a PyroMark ID system with the Pyro Gold Reagents Kit (Qiagen) to determine the percentage of mutant versus wild-type alleles according to relative peak height. The time to transport a result takes approximately 180 min except DNA extraction. Pearson's χ2 and Fisher's exact tests were used to evaluate the relationship between categorical variables. While, Student's t-tests and Mann-Whitney U tests were used to compare two different groups of continuous parametric data. κ analysis was used to evaluate concordance between two methods. Statistical analysis was performed with SPSS software (V.22.0, SPSS, Chicago, Illinois, USA). The Idylla BRAF test could obtain BRAF V600E mutation from a minimal tissue area of the specimen of 3 mm2 and maximum of 707 mm2 when using 20 μm tissue sections, with a minimum tumour cell percentage of 50%. The minimum and maximum requirements by the Idylla BRAF mutation instructions are 25 and 300 mm² when using 10 μm tissue sections. Thyroid FFPE samples with less than minimum and more than maximum tissue area could identify BRAF V600E mutational status. The PNA-clamping PCR and pyrosequencing generated BRAF V600E mutation with a minimal tissue area of the specimen of 3 mm2 using 50 μm tissue sections and maximum 707 mm2 tissue section when using 25 μm tissue sections, which were followed by instruction guideline. The real-time PCR obtained BRAF V600E mutation with a minimal tissue area of the specimen of 3 mm2 and maximum of 707 mm2 when using 50 μm tissue sections, which were followed by instruction guideline. From 79 to 88 (79.8%–88.9%) of 99 cases with PTC displayed the BRAF V600E mutation by four different methods (table 1). No BRAF V600E mutation was detected in the cases with NH. PTC was classified into histological variants. All cases with tall cell (n=5), encapsulated (n=2) and Warthin-like variant (n=1) showed a BRAF V600E mutation. A case with an oncocytic variant (n=1) had no BRAF V600E mutation. Cases with the follicular variant (FV) (n=10) presented BRAF V600E mutation in 40% or 50% depending on the applied methods. True positive was defined as a case, in which the BRAF V600E mutation was identified by two or more methods. A comparative analysis was shown in table 2. The sensitivity and specificity of the Idylla test were 98.8% and 100%, which was superior to real-time PCR and pyrosequencing. The sensitivity and specificity of PNA-clamping PCR method were 100% and 91.7%. The specificity of Idylla, real-time PCR and pyrosequencing were all 100% except for PNA-clamping PCR. The concordance rate (κ value) between Idylla and true positive was 0.974. The κ value of PNA-clamping PCR with Idylla was 0.919, that of real-time PCR with Idylla was 0.853 and that of pyrosequencing with Idylla was 0.809. Of 69 cases with positive BRAF V600E mutation by pyrosequencing, the mean peak mutant amount was 17.5%±1.4% (range: 5.5%–67.1%). The 30 cases with wild-type BRAF showed a peak ranged 0%–4.4%. Discordant results were observed in 11 cases with PTC (table 3). For two cases (sample #43, 82), only PNA-clamping PCR could detected the BRAF V600E mutation. On four cases with PTC (sample #56, 57, 70, 77), the BRAF V600E mutation was detected both by the Idylla and PNA-clamping PCR, but not by the real-time and pyrosequencing methods. For one case with PTC (sample #86), the BRAF mutation was not detected by the Idylla test. One case (sample #94) was not detected by real-time PCR. For three cases (sample #63, 78, 93), the BRAF mutation was not detected by pyrosequencing. The association between the presence of the BRAF V600E mutation and clinicopathological variables was analysed in 99 cases with PTC and included tumour size, lymph node metastasis, extrathyroidal extension and recurrence (table 4). No significant association between the BRAF V600E mutation and clinicopathological variables was identified. Although extrathyroid extension, lymph node metastasis and recurrence were more frequently observed in cases with positive BRAF V600E mutation, this did not attain statistical significance (p=0.154, p=0.385 and p=0.334). In this study, BRAF V600E mutational status of thyroid tissues was evaluated with the Idylla BRAF mutation test. The Idylla test is a CE marked in vitro diagnostic device (CE-IVD) for detection of BRAF mutations in FFPE samples of malignant melanoma. Present study is the first to validate the Idylla technology to detect the BRAF V600E point mutation in FFPE thyroid samples and to compare the Idylla test with PNA-clamping PCR, real-time PCR and pyrosequencing, which are previously validated methods. The detection rate of the BRAF V600E mutation of PTC by the Idylla test was 85.9%. No BRAF mutation was detected in NH. The concordance of the Idylla test with true positive was highest among the different applied methods (k value=0.974). The sensitivity and specificity of the Idylla test to detect the BRAF V600E mutation were superior at 98.8% and 100%. Several methods to detect V600E mutations have been already validated including real-time PCR, DPO-PCR, pyrosequencing and PNA-clamping PCR.16 ,17 PNA-clamping PCR is based on the principle that PNA inhibits wild-type by hybridising normal sequences, and therefore mutant DNA is preferentially amplified. The PNA-clamping PCR reportedly could detect a 0.5% BRAF V600E mutation with high sensitivity.6 Janku et al demonstrated that with controlled samples, a 1% BRAF V600E mutant in a wild-type BRAF background can be detected with the Idylla test.19 He reported that the ΔCT between the signal of wild-type and that of BRAF V600E is greater than 20, which is highly specific. The Idylla test is a real-time PCR-based technique but has better sensitivity compared with that of the other real-time PCR (Seegene) method tested. The pyrosequencing is a quantitative sequencing method that is highly sensitive but it takes a long time to perform the two steps for PCR and sequencing. The Idylla platform takes the shortest time to deliver BRAF V600E mutational status including DNA extraction for one sample among the applied methods. The lowest pyrosequencing peak with a positive BRAF mutation by the Idylla test is 5.5%, which is also read as positive with PNA-clamping PCR and real-time PCR. The Idylla test has a benefit to perform sample processing with a minimum 3 mm2 area with 20 μm tissue sections and yields results with the least amount of FFPE thyroid samples among the applied methods. Thyroid FFPE samples with less than minimum and more than maximum tissue area as specified in the Idylla instruction could generate BRAF V600E mutation, unlike the previous results on malignant melanoma samples.20 The validated tissue amount for the Idylla BRAF test might be different depending on the tissue types and the presence of pigment. When applied to FFPE samples, most molecular techniques require preprocessing steps such as deparaffinisation, tissue digestion and DNA extraction. Manual processing has a risk of cross-contamination and is time consuming. They also need additional infrastructure and skilled staff to perform analyses and interpretation of the results. The Idylla BRAF mutation test does not require manual preprocessing steps because all steps are integrated. Closing of the cartridge after inserting samples starts a fully automatic process from preprocessing to results interpretation on one platform, which eliminates the possibility of cross-contamination between different samples and need for extramolecular infrastructure or highly skilled staff. The Idylla test takes about 120 min for complete processing time (sample preparation, processing and resulting) for detection of the V600E mutation in the FFPE thyroid samples. The Idylla test is a qualitative test that it is not designed to quantify allele frequency or determine all mutations in the target exon. Quantitation of liberated DNA or target mutants is not available yet. However, the Idylla test has a benefit of high specificity and sensitivity to detect BRAF V600E mutation, which is significant as a diagnostic molecular technique. The detection of the V600E mutation becomes increasingly important because pharmacological agents, which inhibit mutant BRAF protein, target cases with a V600E mutation in various cancers such as malignant melanoma, thyroid cancer and colorectal cancer.21–23 The Idylla BRAF mutation test is superior in detecting these BRAF V600E mutations in FFPE thyroid samples compared with the other methods tested. The Idylla BRAF mutation test could be a useful and reliable molecular technique to assess the BRAF V600E mutation status in tumours harbouring the BRAF V600E mutation. In addition, Idylla NRAS/BRAF mutation test has developed and commercialised to detect NRAS and BRAF mutation simultaneously using one cartridge. RAS-BRAF mutational status in thyroid tumour is recently considered to be relevant to reclassify non-invasive FV—PTC as non-malignant nodule from infiltrative FV-PTC. RAS-BRAF mutation of colorectal cancer also gains clinical importance for targeted therapy. Simple, easy and rapid Idylla analysis could be a useful molecular diagnostic tool especially for diagnostic units without infrastructure and technicians. Further investigation for the clinical significance of the Idylla mutation tests would be required. The Idylla test is a CE marked in vitro diagnostic device (CE-IVD) for detection of BRAF mutations that is a fully automated technology with short turn-around time. The sensitivity and specificity of the Idylla test to detect BRAF V600E are 98.8% and 100% and the concordance between Idylla and true positive is 0.974. The Idylla BRAF mutation test could be a useful and reliable molecular technique to assess the BRAF V600E mutation status. Contributors M-KY: planning, principal worker and primary author. M-KJ and Y-ML: coworker and coauthor. S-YL: principal worker and coauthor. GMH: guide and corresponding author. J-MK: conceptualisation, planning and corresponding author. Funding This work was supported by a grant of the Korean Health Technology R&D Project, Ministry of Health and Welfare (HI15C0789) and Basic Science Research Program through the National Research Foundation of Korea (NRF) funded by the Ministry of Science, ICT and Future Planning (No 2014R1A2A1A01004363). Ethics approval Institutional Review Board of Chungnam National University Hospital (CNUH 2016-04-040).